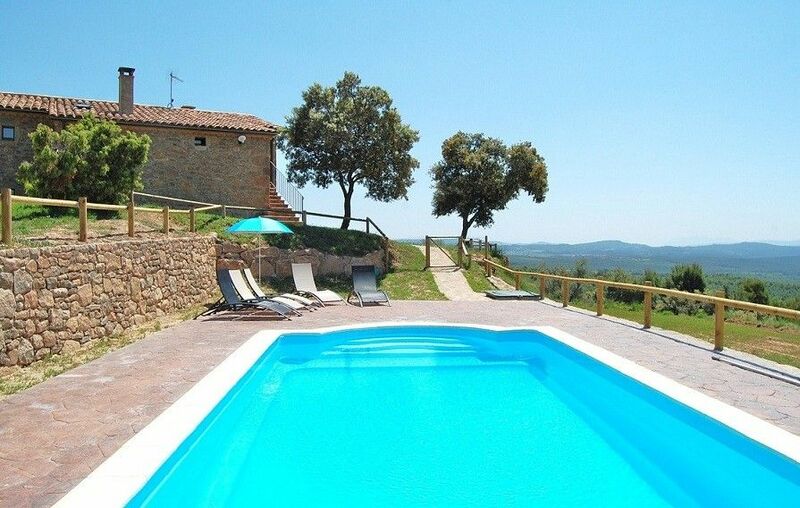 In fantastic surroundings in Catalonia, Spain, you will find the unique holiday home CAN BENÓ which has been fully restored and with the most beautiful swimming pool, sun loungers, covered terrace with barbecue and many facilities for children. CAN BENÓ lies between the two beautiful cities Berga and Solsona (there are 14 km. to each town). The small villages of Mont Major and Nevés are a bit closer, from where you can buy bread and more common groceries. In Mont Major are also a bar / restaurant and a wonderful delicacy. The holiday home, with room for 11 (+2) guests, have five beautiful and spacious bedrooms and 3 super modern bathrooms, one of which is a suite. On the ground floor is a large common area with lounge, dining room and kitchen, large family room with 3 single beds and a large bathroom. On the first floor of CAN BENÓ you will find another lounge area and the remaining 4 bedrooms and 2 bathrooms. The house CAN BENÓ: Here are also two balconies with unique view over the Catalan landscape. The entire house is of a great level of quality as all materials are top quality and everything has been done with great care. This has created a rather unique holiday home where you just feel really good and thus will create the ultimate environment for an excellent holiday.The house is located on the top of a small hill, causing one to feel, that you from the garden, almost can see the entire world and the peace here is perfect for a vacation, where you want to recharge and relax (when not on tour around the region). On the property are a great fenced swimming pool (which is an advantage if you travel with small children) and a large lawn at the back of the house with a playground and space for ball games. The house has a covered BBQ area, which you will prefer on those hot summer days or on the many long summer evenings. The terrace has BBQ, outdoor kitchen and a gas cylinder to the large paella pan. Location with easy access to attractions: There are many factors that create a great holiday home. CAN BENÓ meets just all of them! The decor is lovely, location and views are fantastic, the pool is fenced patio is covered and there is an outdoor kitchen. The garden has space for ball games and it is not far to the nearest village and it lies in the gap between two great cities. Barcelona is less than 100 km. away and Costa Brava 130 km. ABSOLUTELY a great choice of a holiday accommodation - here one can only feel good! Catalonia: Discover the Catalan soul in a historical, carefully preserved but modernised country house. In comfortable distance from the crowded beach resorts, but still with the metropolis Barcelona, lively historical towns as Girona, Tarragona and Vic and the natural parks in The Pyrenees within short reach. We offer vacation in your particular pace, where you blend in with the open-minded and friendly Catalans. Enjoy the silence in the small hills in the pre-Pyrenees. Enjoy sports and outdoor activities as walking, canoeing or mountain biking. Or scamper about in the lively street- and café life in the Catalan towns. Here you will discover gastronomic, cultural and artistic impressions that sticks. As something new we can also offer apartments i Barcelona and many more are comming.Or how about watching a football match along with 98.917 other spectators on FC Barcelona's legendary Camp Nou? The best advise is to come to Catalonia and see for yourself. In the village Montmajor 6 km. away, you vill find a bakery a small grocery shop a bar and a restaurant. The regional capitol is Berga, which is a big town with 20.000 inhabitants. Here, you find a charming town centre with walking street and rambla, shops, restaurants and cafés, and in the outskirts, there are some big supermarkets for large shopping. Also, Berga has a very good tourist office, which is a very good point of departure for the vacation in the area. In the other direction, you will find the historical town of Solsona, with a beautiful Cathedral in the antique town-part and all kinds of shops and supermarkets. There is also a market day, where you can buy vegstables, food as well as clothes and other more and less important things. The price does not include: Catalan tourist tax: € 0,5/adult (+16) per night. Deposit: When booking the property, a deposit equal to 40% must be paid within 8 days to secure the booking. By cancellation more than 2 months before arrival, half of the deposit will be refunded. By cancellation less than 2 months before arrival, the deposit is not refunded.